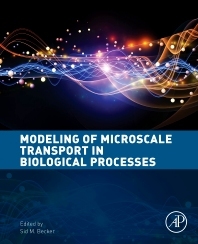 Modeling of Microscale Transport in Biological Processes provides a compendium of recent advances in theoretical and computational modeling of biotransport phenomena at the microscale. The simulation strategies presented range from molecular to continuum models and consider both numerical and exact solution method approaches to coupled systems of equations. The biological processes covered in this book include digestion, molecular transport, microbial swimming, cilia mediated flow, microscale heat transfer, micro-vascular flow, vesicle dynamics, transport through bio-films and bio-membranes, and microscale growth dynamics. The book is written for an advanced academic research audience in the fields of engineering (encompassing biomedical, chemical, biological, mechanical, and electrical), biology and mathematics. Although written for, and by, expert researchers, each chapter provides a strong introductory section to ensure accessibility to readers at all levels. Dr. Becker is a Senior Lecturer in the Department of Mechanical Engineering at the University of Canterbury. He is an Alexander von Humboldt Fellow and is a recipient of the Royal Society’s Marsden Grant. He has held academic positions in Germany, the United States, and New Zealand. His research is primarily in computational and analytical modelling of heat and mass transfer processes in biological media. Dr. Becker is also the co-editor of the previous two books: Heat Transfer and Fluid Flow in Biological Processes (2015) and Transport in Biological Media (2013).